Basilica Budapest is undeniably one of the most impressive of Budapest sights, the St. Stephen’s Basilica is Budapest’s largest church. It can hold 8,500 people and has a 96 meters high dome and 22 meters in diameter. The contrast in architectural styles demonstrates the length of time it needed to be built and the problems which it had to overcome such as the collapse of the basilica itself. Since 2002, St. Stephen’s church and the surrounding area has been renovated and made more appealing to visitors – not to mention safer with a pedestrian-only zone. The facade facing Bajcsy-Zsilinszky street is not the main entrance, it is on Szent Istvan tér on the opposite side. St.Stephen (1000-1038) is the patron saint of the church. He was the first king of Hungary. You can find a statue of him behind the main altar and another above the main entrance. 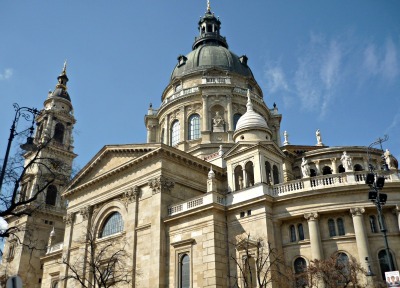 Why should You Visit the Basilica in Budapest? The first thing that can be admired is the astounding mixture of architectural styles – mainly neo-Classical and neo-Renaissance of the churches exterior. 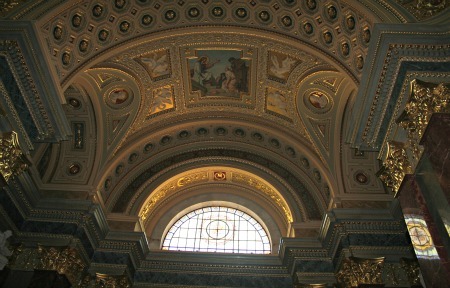 On entering the basilica, the mood becomes quite sombre due to the transition from the light outdoors to a dark interior decorated richly with marble, stucco, gold-leaf and mosaics. This dark and sombre feeling is magnified when you get used to the dim light and get enchanted by the beautiful details and mosaics. Mosaics designed by Hungarian painters and made in Venice by Salviati e Jesorum. On the left side of the main altar you can find the chapel and the display of St. Stephen’s mummified hand. This might strike some as quite bizarre but nevertheless adds to the character of the building. Drop a coin in the slot and the relic lights up. The right hand of Saint Stephen is the most revered relic of the Hungarian Catholic church. The preserved hand of St. Stephen is one of the Basilica’s treasures and each year on the 20th of August it is ceremonially paraded through the city. If you come between April and October, I would recommend going up to the dome for some nice views over the city. There are 302 steps and a lift to the top. The panorama is breathtaking from here, take your time and discover interesting points of the city from a different angle. Going back outside, the pedestrianized area is the perfect spot for a coffee in one of the cafes overlooking the Basilica Budapest. I can also recommend the organ concerts that take place each Monday throughout the summer months until the month of October. How Can You Get To The Basilica? Situated in the Pest side of the city (Szent István Tér, V District) the Basilica Budapest can be reached by most methods of transportation. From any metro station you can take the M1, M2 or M3 to Deak Ferenc ter, and walk north on Baijzi Zsilinski ut, some steps further you will be behind the Basilica. If you wish to take the bus you will need to catch either the number 4, 9 or 15 and for the tram service take the route number 47 or 49. The most notorious facts about the history of the Basilica Budapest is the length of time it took to build and the three architects that worked on it during this period of fifty years. It too so long to build it that people used to say “I will settle up when the Basilica is finished”. It wasn’t complete without having to go through a misfortune event in 1868 when the dome collapsed and would need reconstructing again. 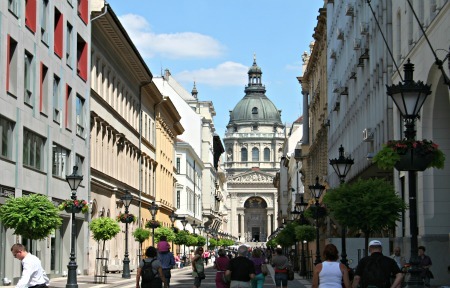 The original plans for the cathedral were drawn up by architect Jozsef Hild in 1845 but the construction was put on hold until six years later after the war of independence. Hild would not live to see the completion of his works, which would be taken over by Miklos Ybl. In the year of 1891, the progress made by Ybl would be passed on yet again after his death to architect Jozsef Krauser. 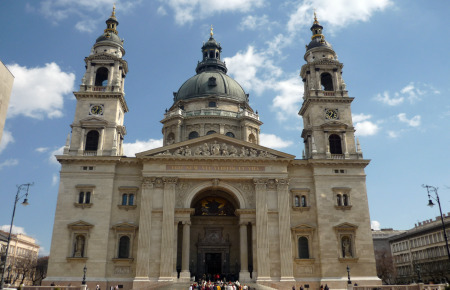 1906 saw the completion of the Basilica, although renovations after World War II would continued right up until 2003 when Budapestians and visitors got a wonderful and complete renovated basilica. Entering the Basilica is free of charge. Visiting the Treasury costs 400 ft and entering the Tower costs 500 ft.
Pensioners and Students: 2000 Ft per person.Theses prices include the entry fee to the Tower.